Our company is the famous manufacturer and exporter of best in class ATM Spare Parts. These parts are mainly used in joining water dispensing ATM machine together efficiently. The offered parts are perfectly manufactured using premium-quality raw materials and latest techniques under the supervision of experienced technocrats as per with set international quality norms. 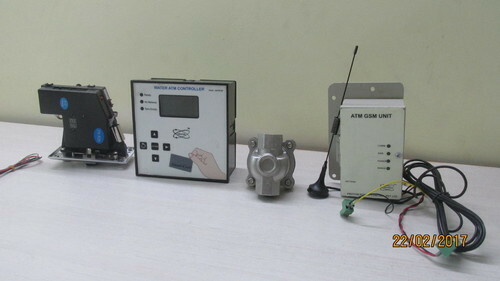 Available in different specifications as given below, the provided ATM Spare Parts can be availed from us at negotiable rates and supplied to our customers in set time frame. Mains as well as 12VDC operation. 2.8 inch TFT Display and 5 programmed keys and user. All water dispensed data available in any measure of time. • Mains as well as 12VDC operation. • RFID card activation. • 2.8 inch TFT Display and 5 programmed keys and user. • Auto Calibration • All water dispensed data available in any measure of time. • Real Time Clock (RTC) • User Friendly operation. Specifications: • Power: 100-270VAC • Solenoid: 12VDC (Internal) • Flow Sensor: Pulse Type • Level Sensing: Treated Water Level Floaty • Display: 2.8" TFT, Monochrome - Programming Keys: 5 • Programming/ Card Charging: Locally as well as through hand • held programmer. • Water Inlet Connection : 3/4" BSPM Union • Water Outlet Connection : 1/2" Solvent Cement • Cabinet model design for safe and healthy, durable and easy installation. • Cold water dispensing on card/coin with very low cost. Looking for “Water ATM spare parts”?